Slingshot, which requires people to send images and videos first before they can view a message, has been released worldwide on iOS and Android. 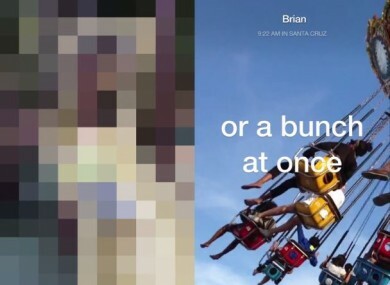 MORE THAN A week after it released its Snapchat-inspired app in the US, Facebook has made its Slingshot available worldwide. Slingshot, which lets users share photos and videos that will disappear a few seconds after viewing, is now available to users who have iOS 7 installed on their iPhone, or Android Jelly Bean and KitKat. Unlike Snapchat, any time you receive a photo or video, you have to send a reply first before you can view it. Through this, the app aims to have people engaging with the app and sending photos regularly, instead of seeing users message at random intervals. Unlike other Facebook services, Slingshot doesn’t require you to have a Facebook account to sign in. Instead, it asks for your mobile phone number to get started, although users can link to their Facebook account or sync with their phone contacts if they want to add people to the service. The app comes from Facebook’s Creative Labs, which is tasked with creating new apps for the company. Its first app from Creative Labs, Paper, was a redesigned version of the news feed, but it hasn’t been released outside the US. Email “Now Facebook is letting anyone download its Snapchat-inspired app”. Feedback on “Now Facebook is letting anyone download its Snapchat-inspired app”.